Chief town in the department of Aude, France. Jews were settled here as early as the fifth century. They lived on the whole amicably with their Christian neighbors, although in 589 the council of Narbonne forbade them to sing psalms at interments, on pain of a fine of six ounces of gold. In 673 the Narbonne Jews took an active part in the revolt of Count Hilderic of Nîmes and Duke Paul against King Wamba. The king was victorious, and the Jews were expelled from the town. In 768 Pope Stephen III. complained bitterly to Archbishop Aribert of the privileges granted to the Jews—among others, of the right to own real estate, to live in the same house with Christians, and to employ Christians in the cultivation of their fields and vineyards. It is related in the Provençal romance of "Philomena" ("Histoire Générale du Languedoc," iii., Addenda, p. 29) that after the legendary siege of Narbonne, Charlemagne, or, according to others, Charles Martel or Pepin the Short, granted numerous privileges to the Jews of the town in reward for the part they had taken in its surrender, and presented them with one-third of the city. This story is confirmed by two Hebrew writers: Meïr ben Simeon of Narbonne and Abraham ibn Daud of Toledo. 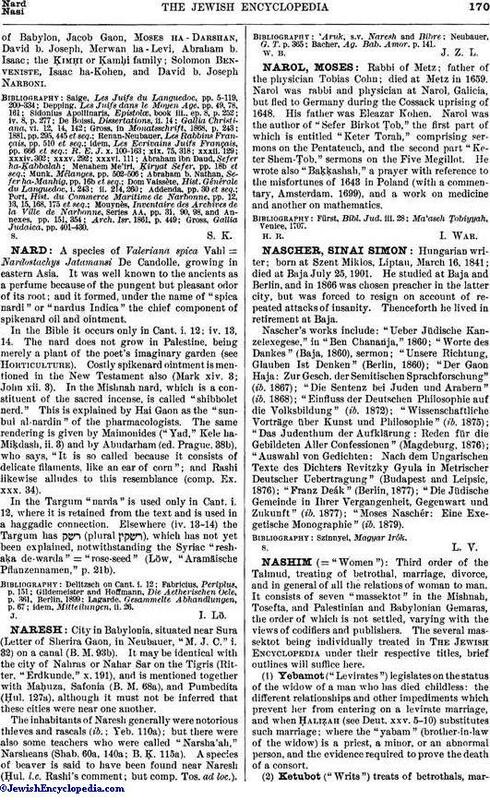 Meïr, in his work entitled "Milḥemet Miẓwah," refers to the privileges which King Charles granted to the Jews of Narbonne; and Abraham ibn Daud says, in his "Sefer ha-Ḳabbalah," that the calif Harun al-Rashid, at the request of Charlemagne, sent to Narbonne Machir, a learned Jew of Babylon, to whom the emperor gave numerous prerogatives and whom he appointed head of the community. This is evidently a legend; but there is no doubt that Machir settled at Narbonne, where he soon acquired great influence over his coreligionists. It is not certain, however, whether he himself bore the title of Nasi ("prince" or "king" of the Jews) as his descendants did, who continued to direct the affairs of the Jewish community. In the twelfth century the community numbered about 2,000 souls; but in consequence of a war between the city and the Count of Toulouse, after the death of Don Emeric IV., Viscount of Narbonne, in 1137, the community dwindled so much that in 1165 Benjamin of Tudela found it to consist of only 300 Jews, the rest having emigrated to Anjou, Poitou, and other French provinces. In 1236 the lives and property of the Jews were put in jeopardy. 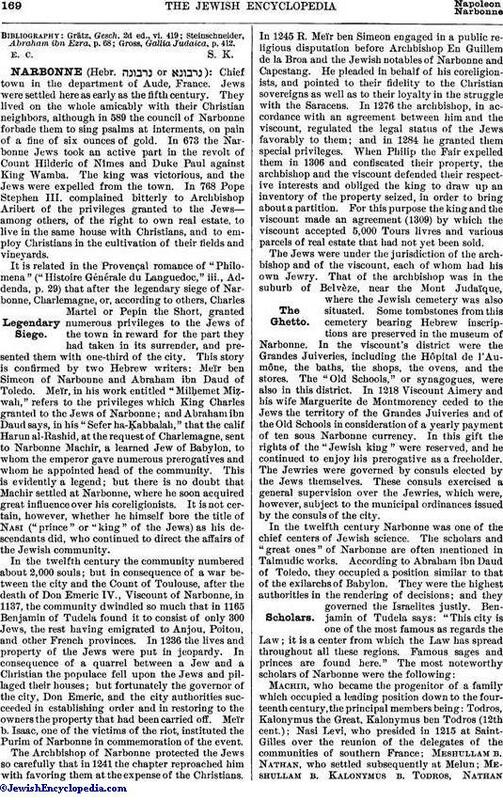 In consequence of a quarrel between a Jew and a Christian the populace fell upon the Jews and pillaged their houses; but fortunately the governor of the city, Don Emeric, and the city authorities succeeded in establishing order and in restoring to the owners the property that had been carried off. Meïr b. Isaac, one of the victims of the riot, instituted the Purim of Narbonne in commemoration of the event. The Archbishop of Narbonne protected the Jews so carefully that in 1241 the chapter reproached him with favoring them at the expense of the Christians. In 1245 R. Meïr ben Simeon engaged in a public religious disputation before Archbishop En Guillem de la Broa and the Jewish notables of Narbonne and Capestang. He pleaded in behalf of his coreligionists, and pointed to their fidelity to the Christian sovereigns as well as to their loyalty in the struggle with the Saracens. In 1276 the archbishop, in accordance with an agreement between him and the viscount, regulated the legal status of the Jews favorably to them; and in 1284 he granted them special privileges. When Philip the Fair expelled them in 1306 and confiscated their property, the archbishop and the viscount defended their respective interests and obliged the king to draw up an inventory of the property seized, in order to bring about a partition. For this purpose the king and the viscount made an agreement (1309) by which the viscount accepted 5,000 Tours livres and various parcels of real estate that had not yet been sold. The Jews were under the jurisdiction of the archbishop and of the viscount, each of whom had his own Jewry. That of the archbishop was in the suburb of Belvèze, near the Mont Judaïque, where the Jewish cemetery was also situated. Some tombstones from this cemetery bearing Hebrew inscriptions are preserved in the museum of Narbonne. In the viscount's district were the Grandes Juiveries, including the Hôpital de l'Aumône, the baths, the shops, the ovens, and the stores. The "Old Schools," or synagogues, were also in this district. In 1218 Viscount Aimery and his wife Marguerite de Montmorency ceded to the Jews the territory of the Grandes Juiveries and of the Old Schools in consideration of a yearly payment of ten sous Narbonne currency. In this gift the rights of the "Jewish king" were reserved, and he continued to enjoy his prerogative as a freeholder. The Jewries were governed by consuls elected by the Jews themselves. These consuls exercised a general supervision over the Jewries, which were, however, subject to the municipal ordinances issued by the consuls of the city. Machir, who became the progenitor of a family which occupied a leading position down to the fourteenth century, the principal members being: Todros, Kalonymus the Great, Kalonymus ben Todros (12th cent. ); Nasi Levi, who presided in 1215 at Saint-Gilles over the reunion of the delegates of the communities of southern France; Meshullam b. Nathan, who settled subsequently at Melun; Meshullam b. Kalonymus b. Todros, Nathanof Babylon, Jacob Gaon, Moses ha-Darshan, David b. Joseph, Merwan ha-Levi, Abraham b. Isaac; the Ḳimḥi or Ḳamḥi family; Solomon Benveniste, Isaac ha-Kohen, and David b. Joseph Narboni. Gross, Gallia Judaica, pp. 401-430.